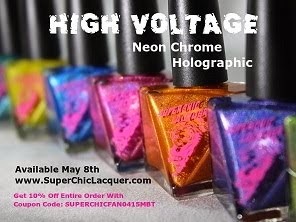 I have for you today, the SV by Sparkly Vernis Palm Trees At Night 2015 Spring Collection full of holoy goodness! I think linear holos is one of my favourite types of polishes, the more holo, the better. I have a weak spot for linear holos - whenever I have to choose just a polish to wear on the go, I always reach for a linear holo. Not only are the colours super fabulous in this collection, but there is a flakie, 2 softer linears and 2 stronger linears. The formulas are quite nice too, opaque in just 2 easy coats for most. I loved that I was able to capture the purple and blues in some of my shots. I love this softer green - and the linear holo is more intense in real life. I love this polish - the colour, the easy application, the holo - just gorgeous! The only thing that could be an issue is because the pigment is so dark, that it may cause staining, so please keep that in mind. Extra pictures because it's just so beautiful!